Tens of thousands of people were expected to march through Hong Kong on Saturday to demand full democracy, as the former British colony marks the ninth anniversary of its return to Chinese rule. However, the annual demonstration was believed likely to draw far fewer people than in previous years, when as many as half a million marched peacefully for the right to pick their city's leader and entire legislature. Demands for democratic reform have largely cooled in Hong Kong with a steadily improving economy and leadership change. Hong Kong was promised broad autonomy when it was returned to China on July 1, 1997 under a "one country, two systems" formula, but Beijing has ruled out full democracy for the territory for the next few years. An 800-member election committee partial to Beijing choses Hong Kong's leader, and only half of its 60 lawmakers are directly elected. Analysts had predicted that about 50,000 or less would join this year's march, many of them inspired by popular former official Anson Chan's decision to take part. Chan, an influential politician who was Hong Kong's No. 2 official before retiring in 2001, had stoked interest in the protest in recent days by repeatedly urging the public to take to the streets. She has also attacked the Hong Kong and Beijing governments for dragging their feet granting the territory full democracy. Hong Kong's pro-Beijing camp has scorned her moves as politically motivated, and accused her of setting the stage for a political comeback. The turnout for Saturday's march will be closely watched by both the Hong Kong and central Chinese governments, which have stressed the importance of the city's stability and economic prosperity over political changes. In a speech Saturday, Hong Kong's leader Donald Tsang highlighted the importance of economic growth and building a harmonious society. He did not mention political reform. "As our economy gains momentum in its growth, we must grasp the opportunity to keep it in good shape so that we could live up to our country's expectations for Hong Kong," he told guests attending a ceremony celebrating the territory's return to China nine years ago. The ceremony was briefly disrupted when radical lawmaker Leung Kwok-hung yelled "End [China's] one-party dictatorship!" just ahead of Tsang's speech. Leung was asked to leave before he could protest further. Leung and other pro-democracy lawmakers last year voted down a government-proposed political reform proposal, saying it was limited and did not include a timetable of when the territory could become fully democratic. The movement for democratic progress has since lost steam, but the pro-democracy camp stresses that the annual march must be continued to show Hong Kongers' determination to fight for full voting rights. Meanwhile, Beijing loyalists held a parade Saturday to celebrate the handover anniversary. Organizers said about 40,000 people turned up for the event, which featured traditional Chinese lion dances and a marching performance by hundreds of Chinese soldiers. Retiree Chen Man-kong, 77, said he has attended July 1 celebrations ever since the handover in 1997. 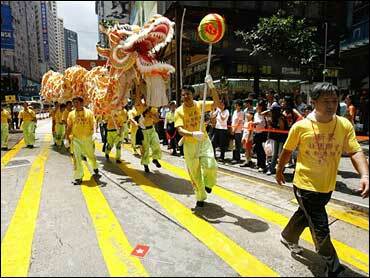 "Hong Kong's economy is performing very well," he said. "There is no point to protest."